The dev team is moving the Legacy project development from sourceforge.jp to the new repository at sourceforge.net (international). This page explains how to use CVS. A minimum of CVS knowledge is required, read please the following Wikipedia CVS. You can receive the notification by the special Mailing List, when developers commit update source code to CVS. The notification is written diff and comment in poor English. This ML is useful for you to notice the movement of the core development team. Now, there is only one Mailing List for XOOPS Cube Lagacy (aka Package_Legacy). If more base module project is happen, another Mailing List will be prepared. To start receiving the notification, you have to register your mail address in Mailing List subscription page. You may write your mail address, your password and your confirm password into the following text-box. If you prefer, you can specify your prefering language other than English. After then, you may receive the confirm mail in Japanese. If you receive that mail, please click URL. In addition, comments in files isn't fine but include some useful informations. Logs of CVS and these comments make it easy to understand changes. The snapshot is the latest archive of the specific branch. It is maked by timer automatically. You can download it from here. This is the most easist way to get the latest CVS version. However, you have to pay attention about that the timer makes it. The archive that you think as the latest version may includes old files before 4 hours. The simplest means to take a part in XOOPS Cube activity is that you always trace the update of the 2.1 branch and report the bugs or the impression. You can select your tool from TortoiseCVS and Eclipse. I don't explain the details of these tools because these are famous. This tools extends Windows shell. CVS menus are appended to your context menu after you install it. You may choose the branch if you need it. Push 'Revision' tab, and select 'Branch Tag' radio button. Input the branch name to the name form. Checking out will be started with clicking 'OK' button. You should pay attention to that the directory name is 'Package_Legacy'. You must replace the branch-tag name which is explained in this page, with the current branch-tag name. Eclipse is famous IDE in Java. It has the excellent CVS explorer. Here is the video tutorial to check out XOOPS Cube with Eclipse. 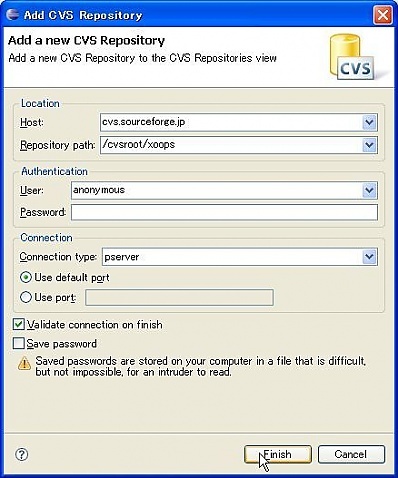 By that, the CVS Repositories window will be opened in the left side. To open the pop-up menu, click the right-button of your mouse. Click New -> Repository Location. Input CVS informations to the form. By that, the new tree will be shown up in the CVS Repositories window. Open the added tree, by clicking [+]. Open the pop-up menu by clicking the right button of your mouse on Package_Legacy. 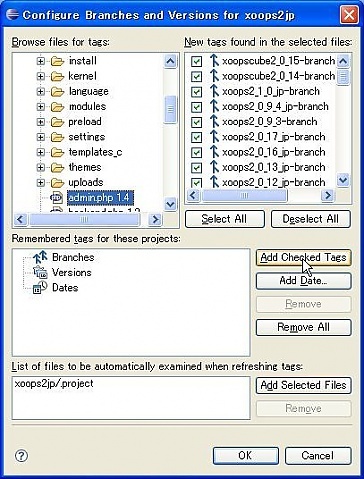 Click Configure Branches and Versions..., if you need it. Open Branches and Open the branch you want. Open the pop-up menu on the folder icon. Now, Package_Legacy doesn't have any branches. The project team gives the tag to CVS at release. The naming convention is the following.